Both endothelial cells and podocytes are sources for laminin α1 at the inception of glomerulogenesis and then for laminin α5 during glomerular maturation. Why glomerular basement membranes (GBM) undergo laminin transitions is unknown, but this may dictate glomerular morphogenesis. In mice that genetically lack laminin α5, laminin α5β2γ1 is not assembled, vascularized glomeruli fail to form, and animals die at midgestation with neural tube closure and placental deficits. It was previously shown that renal cortices of newborn mice contain endothelial progenitors (angioblasts) and that when embryonic day 12 kidneys are transplanted into newborn kidney, hybrid glomeruli (host-derived endothelium and donor-derived podocytes) result. Reasoning that host endothelium may correct the glomerular phenotype that is seen in laminin α5 mutants, α5 null embryonic day 12 metanephroi were grafted into wild-type newborn kidney. Hybrid glomeruli were identified in grafts by expression of a host-specific LacZ lineage marker. Labeling of glomerular hybrid GBM with chain-specific antibodies showed a markedly stratified distribution of laminins: α5 was found only on the inner endothelial half of GBM, whereas α1 located to outer layers beneath mutant podocytes. For measurement of the contribution of host endothelium to hybrid GBM, immunofluorescent signals for laminin α5 were quantified: Hybrid GBM contained approximately 50% the normal α5 complement as wild-type GBM. 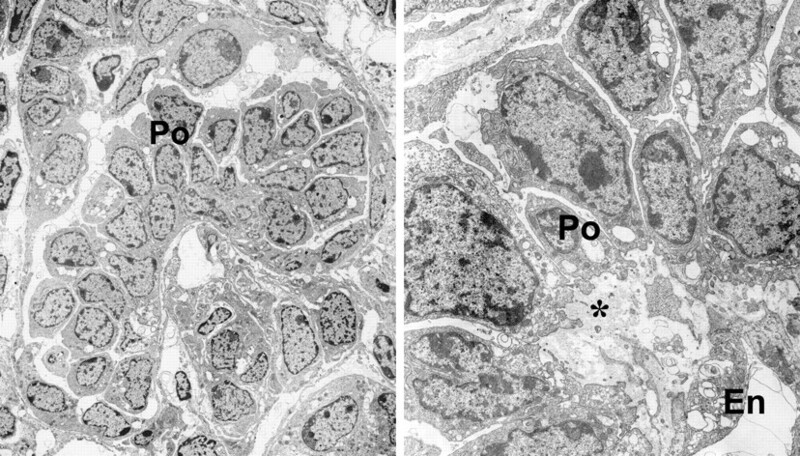 Electron microscopy of glomerular hybrids showed vascularization, but podocyte foot processes were absent. It was concluded that (1) endothelial and podocyte-derived laminins remain tethered to their cellular origin, (2) developing endothelial cells contribute large amounts of GBM laminins, and (3) podocyte foot process differentiation may require direct exposure to laminin α5. Developing glomeruli undergo major transitions in glomerular basement membrane (GBM) protein composition. Specifically, GBM of the most immature nephrons (comma- and S-shaped) contain collagen α1,α2 (IV) and laminin α1β1γ1 (Ln 111). As glomeruli mature, these proteins disappear and are replaced by collagen α3,α4,α5(IV) and laminin α5β2γ1 (Ln 521), and this composition persists in GBM throughout life.1,2 Although mechanisms for the collagen (IV) and laminin isoform substitutions are not known, these transitions are believed to be necessary for acquisition of the highly differentiated state that is exhibited by glomerular endothelial cells and podocytes. Indeed, both endothelial cells and podocytes synthesize the different laminin chains at appropriate stages,3 and this may be true for some or all of the different collagen (IV) isoforms as well. We previously showed in embryonic mouse kidneys that endothelial progenitors (angioblasts) that reside among nephrogenic mesenchymal cells can form the renal microvasculature, including the glomerular endothelium.14 Furthermore, when embryonic kidneys are grafted into newborn host kidney cortices, angioblasts within the nephrogenic zone of host kidneys migrate into grafts and, together with angioblasts of graft origin, establish the microvasculature.14 In engrafted kidneys, this results in glomerular hybrids that contain host-derived endothelial cells and graft-derived podocytes.14 Here, we sought to determine whether embryonic kidneys derived from laminin α5 knockouts would develop when grafted into kidneys of genetically tagged newborn hosts that were wild-type for laminin. Specifically, we examined whether host endothelial cells would populate glomeruli within grafts and whether laminin α5 would be deposited in GBM of these hybrid glomeruli. We also investigated the ultrastructure of capillary walls in glomerular hybrids and measured the relative contribution of endothelial cells to GBM laminin. When cryostat sections from E16 laminin α5 knockout kidneys were doubly immunolabeled with anti–laminin α5 chain and anti–vascular endothelial growth factor receptor 2 (anti-VEGFR2) IgG, VEGFR2-positive endothelial cells were seen within a few rudimentary glomerular structures, but laminin α5 was absent (Figure 1A). Sections from wild-type siblings, by contrast, contained early capillary loop–stage glomeruli with endothelial cells closely apposed to laminin α5-positive GBM (Figure 1B). In addition, Bowman's capsule, along with some tubular basement membranes of wild-type kidneys, were positive for laminin α5 (Figure 1B). (A) Cryostat section from a laminin α5 knockout embryo double labeled with anti–vascular endothelial growth factor receptor 2 (anti-VEGFR2; to label endothelial cells: green) and anti–laminin α5 (red). A few primitive glomerular capillaries are present (arrows), but laminin α5 is absent. (B) Section from wild-type sibling doubly labeled with anti-VEGFR2 (green) and anti–laminin α5 (red). Note early capillary loop–stage glomerulus containing both endothelial cells as well as laminin α5 in developing glomerular basement membrane (GBM; arrows). Sections of host kidneys that had been processed for β-galactosidase histochemistry were examined at low magnification to identify those that contained grafts of laminin α5 null metanephroi. Grafts were distinguished as pale, unstained areas surrounded by deeply stained host tissue as a result of the β-galactosidase reaction product. 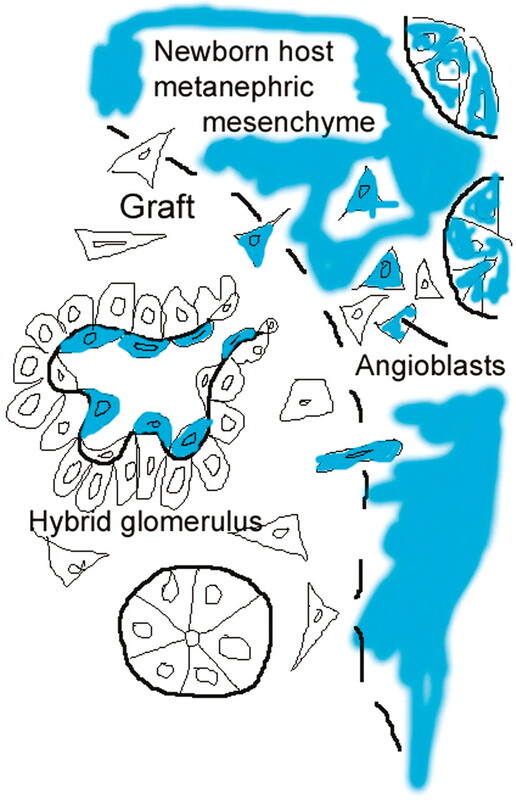 These sections were then examined at higher magnification to determine whether glomeruli within grafts contained host-derived blue cells, signifying their hybridity (shown diagrammatically in Figure 2). When sections bearing hybrid glomeruli were found, the serial sections before and after these slides were then processed for immunofluorescence labeling with anti-laminin antibodies. The following results are representative of six separate grafts that contained proven hybrid glomeruli. Figure 3 shows two serial pairs from different grafts, each with one section processed for β-galactosidase histochemistry and viewed with differential interference contrast optics, and the adjacent section was doubly immunolabeled for laminin α1 and α5 chains and viewed by epifluorescence. Note that laminin α5 protein was present in GBM of hybrid glomeruli but not in Bowman's capsule or in tubular basement membranes within the grafts. Diagram illustrating how migration of host-derived angioblasts can result in hybrid glomeruli within grafts. In this case, the host bears the lineage marker, LacZ, which provides the blue label. Sections showing hybrid glomeruli. Top panels are from separate samples processed for LacZ; bottom panels show corresponding serial sections immunolabeled for laminin. (A and C) Host tissue is intensely blue and can easily be distinguished from graft (dashed black line demarcates margin between host and graft tissue). Note ingress of a number of host-derived cells into graft and the formation of hybrid glomeruli (arrows) that contain host (blue) endothelial cells. (B and D) Immunofluorescence images of serial sections doubly labeled for laminin α1 (green) and α5 (red) chains. Laminin α5 protein is present in GBM of hybrid glomeruli (*same tubule in serial sections). To examine GBM of hybrid glomeruli more closely, we carried out confocal microscopy of sections that were dually immunolabeled for laminin α1 and α5. As shown in Figure 4, laminin α5 was present in the vascular stalk as well as the GBM. However, laminin α1, which ordinarily is no longer present in capillary loop–stage glomeruli, persisted in GBM of glomerular hybrids (Figure 4, B through D). Furthermore, the hybrid GBM were clearly stratified, with laminin α5 found predominantly in the inner, subendothelial layer, and laminin α1 occupying the outer, subepithelial layer (Figure 4, C and D). In addition, the amount of laminin α5 that was present within a given glomerulus seemed to correlate positively with the degree of hybridity. 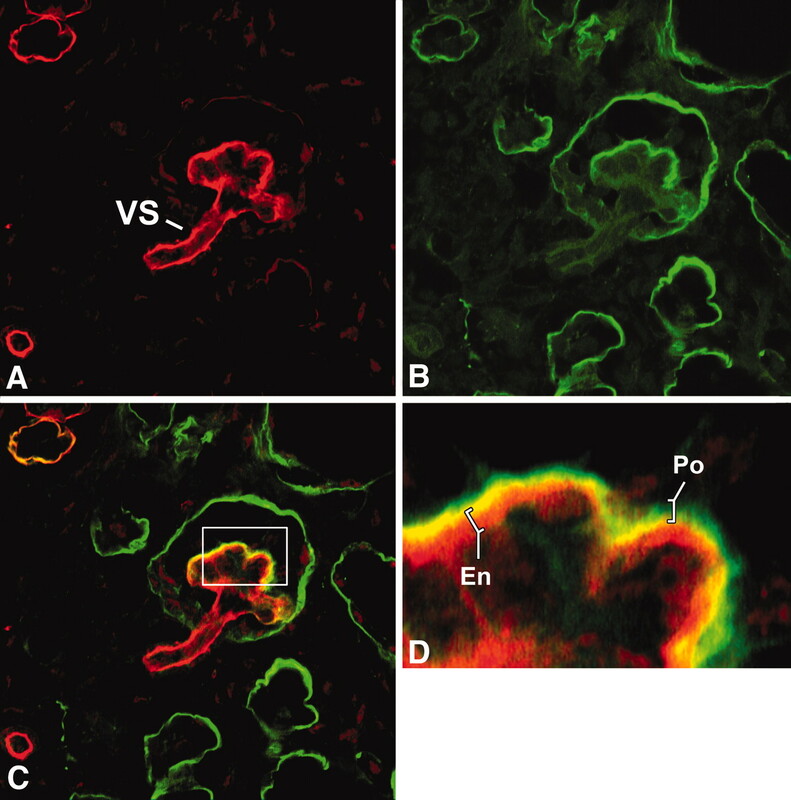 For example, Figure 5A shows a section through a graft that contained one glomerulus with a large number of host-derived endothelial cells, a second glomerulus with a few host cells, and a third glomerulus with no host cells evident. The serial, immunolabeled section shows abundant expression of laminin α5 in the glomerulus with the largest amount of host endothelium, weak expression of α5 in the glomerulus populated by a few host cells, and no α5 apparent in glomeruli that lacked host cells (Figure 5B). Similarly, the same glomerulus that contained the most numerous host endothelial cells also exhibited the largest amount of laminin α1 in a GBM pattern (Figure 5, C and D). Separate confocal images of the same hybrid glomerulus, dually labeled for laminin α1 (green) and laminin α5 (red). Note laminin α5 presence in vascular stalk (VS) as well as GBM. A higher power view of merged image C is shown in D. GBM in glomerular hybrid is stratified; laminin α5 is on endothelial surface, whereas laminin α1 (which ordinarily is not present in capillary loop–stage glomeruli) occupies podocyte surface of GBM. Central areas of signal overlap appear yellow. Images relating degree of glomerular hybridity with laminin α5 expression. 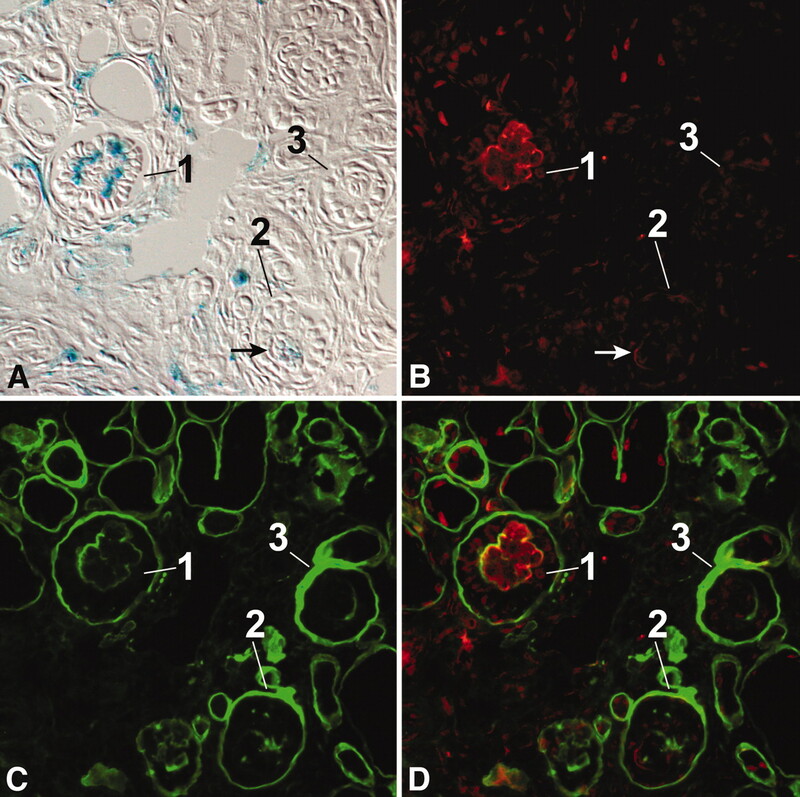 (A) Section processed for LacZ, showing a hybrid glomerulus that contains many host-derived endothelial cells (1), a hybrid with a few host cells (2), and a nonhybrid glomerulus with no host cells (3). (B through D) Confocal images from serial section showing distribution of laminin α5 (B), laminin α1 (C), and merged image (D). Maximal laminin α5 immunolabeling occurs in hybrid glomerulus with most host cells (1). To investigate the ultrastructure of glomerular hybrids, we carried out electron microscopy of three separate grafts that contained hybrid glomeruli and neighboring host tissue using the Bluo-gal reagent to identify cells that expressed β-galactosidase. Glomeruli that developed within ROSA26 host kidneys had β-galactosidase reaction product appearing as electron-dense precipitates on plasma membranes of both endothelial cells and podocytes (Figure 6). GBM condensation and podocyte foot process formation, although still incomplete in the host kidney at this age (postnatal day 9), appeared entirely normal (Figure 6). For investigation of the ultrastructure of glomeruli developing within grafts, tissues were developed with Bluo-gal, an alternative substrate for β-galactosidase that forms an insoluble, electron-dense precipitate. In glomeruli developing within ROSA26 host tissue, both endothelial cells and podocytes express the transgenic enzyme (black precipitates, arrows). GBM condensation and podocyte foot process formation, although incomplete at this stage of development, appear normal. Two classes of glomeruli were identified within grafts: Those that lacked host-derived endothelium (i.e., nonhybrid, laminin α5 knockout glomeruli), and those that contained host-derived endothelium (glomerular hybrids). Laminin α5 knockout glomeruli were nonvascularized and unperfused by blood cells (Figure 7A). In addition, their GBM were loosely organized, and podocyte foot processes were absent (Figure 7B). Hybrid glomeruli with host-derived (Bluo-gal positive) endothelium had GBM that appeared more condensed and better organized than the nonhybrids (Figure 8, A and B), and capillaries perfused by erythrocytes were readily identified (Figure 8B). However, like nonhybrid glomeruli, formation of podocyte foot processes were not observed in glomerular hybrids (Figure 8). Glomeruli developing within grafts that lack host-derived endothelium (i.e., nonhybrid, laminin α5 knockout glomeruli) do not contain Bluo-gal reaction product and are nonvascularized. GBM are loosely organized (*), and podocyte (Po) foot processes are absent. En, endothelium. 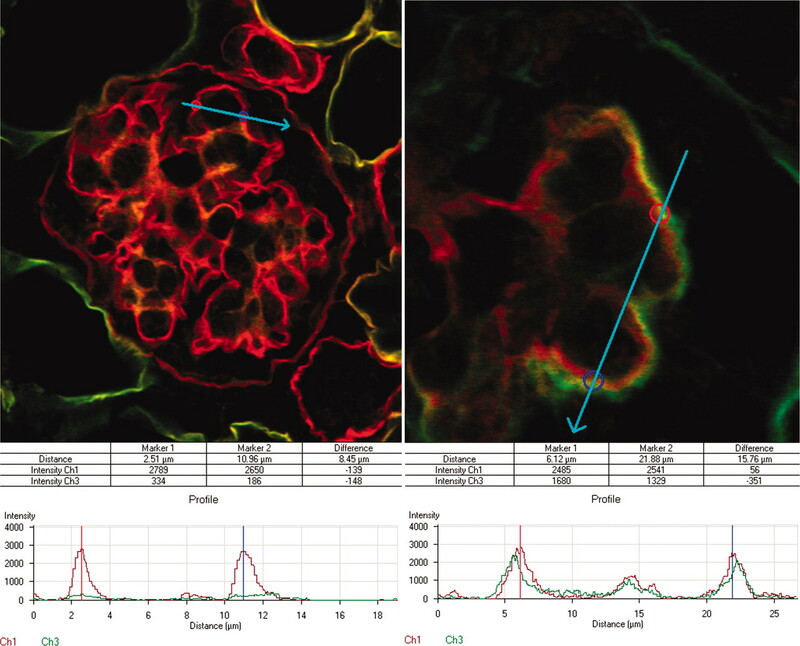 Ultrastructural examination of hybrid glomeruli show host-derived, Bluo-gal–positive endothelial cells (En; arrows) and Bluo-gal–negative podocytes (Po). GBM are better organized than in nonhybrid glomeruli, but podocyte foot processes are absent. RBC, erythrocyte, signifying perfusion. To estimate the relative contribution of endothelial cells to developing GBM, we quantified anti–laminin α5 immunofluorescence signal strengths across GBM from host glomeruli and compared them with those from hybrid glomeruli. Figure 9 (left panel) shows confocal images of a host glomerulus and regions where GBM intensities were measured (blue line). Histogram plots at bisected regions of the GBM showed peak intensity values for anti–laminin α5 chain (red) that measured approximately 3000 luminosity units. Only background levels for anti–laminin α1 chain (green) were observed at these same points in normal, host glomeruli (Figure 9). Using this technique, anti–laminin α5 intensity values averaged 2889 ± 134 (n = 26) for normal, host GBM. As described previously, a range of intensities for anti–laminin α5 (and anti-α1) were observed in hybrid glomeruli, and the intensities seemed to be linked directly with the extent of vascularization by wild-type host endothelial cells. Figure 9 (right panel) shows a hybrid glomerular capillary with a relatively large amount of laminin α5 (as well as α1) immunoreactivity. Owing to the range of anti–laminin α5 fluorescence intensities seen in hybrid GBM, we selected for measurement only hybrid glomeruli that contained significant immunolabeling for laminin α5. Using this criterion, maximal anti–laminin α5 intensities for hybrid GBM averaged 1675 ± 109 (n = 23), or approximately half that seen in normal GBM of wild-type host glomeruli. For evaluation of the relative contribution of endothelial cells to developing GBM, immunofluorescence signal strengths across GBM were quantified from host glomeruli (left) and compared with those from hybrid glomeruli (right) in adjacent areas that contained metanephric grafts. Histogram plots show peak intensity values for laminin α5 chain (red) at bisected regions of the GBM. Only background levels for laminin α1 chain (green) are observed at these same points in normal glomeruli (left), whereas hybrids show abnormally high levels of α1 in outer layer of GBM (right). Four new observations stem from these experiments. First, when laminin α5 mutant metanephroi were grafted into ROSA26 transgenic hosts, numerous hybrid glomeruli within grafts that contained host-derived endothelial cells were identified and were perfused with blood. These glomerular hybrids thereby indicate at least partial correction of the aborted glomerulogenesis seen in laminin α5 null kidneys, which is the most prominent kidney phenotype for this mutation. Second, most hybrid glomeruli contained distinctly stratified GBM with the unusual composition of both laminin α5 and α1. Laminin α5 derived from host endothelial cells distributed to the subendothelial GBM surface, whereas laminin α1 occupied only the subepithelial GBM layer beneath mutant podocytes. Third, despite the formation of perfused glomerular capillaries, podocyte foot process formation failed to occur in hybrid glomeruli. This may have been due to the unusual laminin composition in hybrid GBM and specifically the retention of laminin α1 and/or the absence of laminin α5 in the subepithelial layer. Finally, endothelial cells in hybrid glomeruli contributed importantly to the GBM, at least with respect to laminin α5. Perhaps these cells are also sources of significant GBM protein in glomerular fibrotic disorders. Initial studies on laminin α5 null kidneys showed that endothelial cells fail to adhere within developing glomeruli and true capillary loops never form.13 In addition, the podocytes in these mutants are disordered and cluster as a multilayer of cells in the defective glomeruli. The normal disappearance of laminin α1 still occurs, but because of an absence of laminin α5, an intact basement membrane structure is not maintained in laminin α5 mutants.13 Why endothelial cells are excluded from laminin α5 null glomeruli is unclear, but this may be due to inadequate adhesive properties and the failure of a definitive GBM to form. Although laminin α4 is present, this particular α chain is truncated and may not be able to create a stable laminin network by itself in the absence of full-length laminin α chains.13 As reported here, hybrid glomeruli achieved through grafting laminin α5 null metanephroi into laminin wild-type hosts clearly contained host-derived endothelial cells and were blood-perfused. 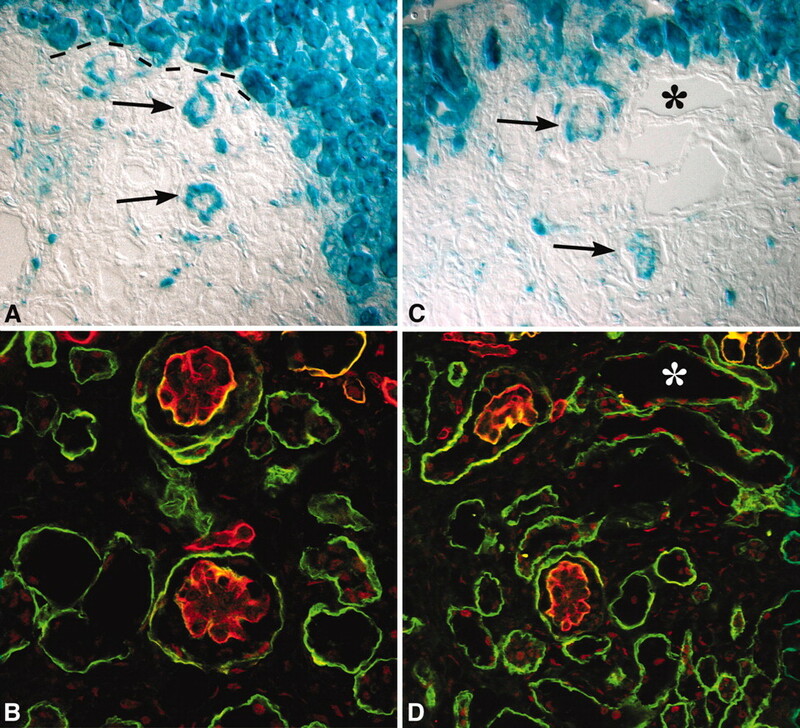 These findings provide further evidence indicating that the initial signals for glomerular vascularization by endothelial cells are operative in laminin α5 mutants. In addition, only hybrid glomeruli within grafts contained laminin α5 in GBM; glomeruli that were not vascularized by host-derived endothelial cells were entirely negative for α5. One of the more striking findings from our studies was that GBM in glomerular hybrids displayed a distinctly stratified distribution pattern for laminins. Specifically, laminin α5 was found on the inner, endothelial layer of the GBM. This evidence confirms previous findings in normal mice showing an endothelial (as well as podocyte) origin of laminin α5.3 Because laminin α1 is also expressed by endothelial cells of the most immature glomeruli,3 our results also suggest that the laminin α1:α5 transition occurred normally in the host-derived endothelial cells that occupied hybrid glomeruli. Quite surprising, however, and unlike the previous findings in laminin α5 mutant embryos,13 our studies of glomerular hybrids showed the retention of seemingly large amounts of laminin α1 in hybrid GBM. Like laminin α5, the α1 distribution was distinctly stratified but in this case was found exclusively in the outer, subepithelial layer of the GBM beneath the mutant podocytes. These results indicate that the normal process for downregulation of laminin α1 synthesis and/or its removal from the GBM of hybrid glomeruli had not transpired. However, because the aberrant presence of laminin α1 occurred most abundantly in glomerular hybrids, we speculate that the presence of wild-type endothelium (and/or the presence of a vascular supply) enhanced mutant podocyte survival and promoted their synthesis and deposition of laminin α1. Another intriguing finding regarding the stratified GBM in hybrid glomeruli was that the laminin that originated from the endothelial cells did not extend across the full GBM width and contact podocytes. Similarly, the laminin α1 that was derived from mutant podocytes did not project across the GBM and contact the endothelium. These results suggest that laminins, once secreted, remain closely associated with their respective cell of origin, presumably tethered to the integrins, dystroglycan, and other basement membrane–binding proteins on the basal surfaces of glomerular endothelial cells and podocytes, respectively. Furthermore, because we found laminin α5 only in serial sections that came immediately before or after sections that contained proven hybrid glomeruli, the secreted laminin apparently did not diffuse large distances from its cell of origin in the plane of the GBM. Again, this may reflect close association of GBM laminin with plasmalemmal basement membrane receptors. An important caveat is that the GBM assembled in these glomerular hybrids created through grafting may not accurately represent what occurs during normal glomerular development. As discussed previously, the GBM originates initially by the fusion of a dual basement membrane structure assembled jointly by endothelial cells and podocytes.3,15 Perhaps this fusion was incomplete (or failed entirely) in hybrid glomeruli, possibly because of the atypical laminin composition in the podocyte layer. Alternatively, basement membrane proteins other than laminin may behave differently in hybrid GBM, and we are currently using this same grafting technology with different basement membrane mutants to address this possibility. In addition, new experiments that make use of conditional or cell-specific expression of reporter-tagged basement membrane proteins may help to clarify this issue further. Nevertheless, our findings clearly suggest that the GBM may indeed contain layers or strata of compositionally distinct matrix. If true, then delaminating disorders such as Alport disease may involve events that disrupt adhesive interactions between these GBM strata. Although mechanisms that account for the multiple phenotypes in laminin α5 mutants are not fully understood, at least some of the effects may be due to an absence of the α5, C-terminal laminin type globular (LG) domain. This domain consists of five homologous structural subunits (LG1 through 5)22 and mediates binding to integrins, dystroglycan, Lutheran, and/or other laminin receptors on a variety of cells.23,24 For examination of LG function in detail, transgenic mice in which all or part of the α5 LG domain was replaced with corresponding regions of the human α1 LG domain were created.25 These laminin variants were then mated onto the laminin α5 knockout background. Like laminin α5 mutants, mice that express the entire α1 LG domain in place of native α5 die before birth. However, their glomerular capillary walls develop normally and contain endothelial cells, intact GBM, and differentiated podocytes with foot processes.25 However, glomerular capillary diameters are unusually large, apparently because the intercapillary mesangial cells fail to adhere properly to a GBM that lacks the α5 LG domain.25 This issue was investigated further by creating mutants that expressed α1 LG3 through 5 in place of α5 LG3 through 5.26 In this case, glomeruli develop normally initially and mice survive for several months. They eventually die of nephrotic syndrome, however, with greatly thickened GBM, particularly in the subendothelial layer, indicating that the α5 LG 3 through 5 domain is necessary for maintenance of normal glomerular structure and function.26 Perhaps future studies on glomerular hybrids that express various laminin domain combinations will shed additional light on specific regions of the laminin molecule that are important for normal glomerulogenesis. Previously, we showed that both glomerular endothelial cells and podocytes synthesize laminins, but until now, it has not been possible to measure the relative contribution of each cell layer, respectively, to the GBM. Through the creation of glomerular hybrids after grafting, we were able to document for the first time that endothelial cells contribute significant amounts of laminin α5 to the GBM. Indeed, our immunofluorescence quantification of hybrids showed that up to approximately half of the full GBM complement of laminin α5 could be derived from the endothelium. Whether the same is true for normal, wild-type glomeruli is not yet known, however. In addition, whether endothelial cells participate heavily in synthesis of other important constituents of the GBM, such as collagen type IV, is unclear. Nevertheless, our findings in developing glomeruli raise the possibility that glomerular endothelial cells of mature kidney may also be a source of significant amounts of extracellular matrix in fibrotic disorders, and we are testing this hypothesis. If this proves to be true, then therapies that specifically inhibit glomerular endothelial matrix deposition and could effectively slow progressive glomerulosclerosis might be developed. Laminin α5 mutant mice were created and genotyped as described previously.12,13 ROSA26 transgenic mice, which express the bacterial transgene LacZ ubiquitously but are otherwise normal,27 were obtained from The Jackson Laboratory [Bar Harbor, ME; strain B6;129S-Gt(ROSA)26Sor/J]. All procedures with animals were approved by the Institutional Animal Care and Use Committee to ensure compliance with the Health Research Extension Act, Animal Welfare Act, and the Public Health Service Policy on Humane Care and Use of Laboratory Animals. Monoclonal rat anti-mouse laminin α1 chain (mAb 8B3) and rabbit anti-mouse laminin α5 chain antibodies were prepared and characterized as described previously.28,29 Anti–rat fluorescein and anti–rabbit rhodamine IgG were obtained from MP Biomedicals (Irvine, CA). Anti-VEGFR2 was purchased from BD-PharMingen (San Diego, CA). For creation of hybrid glomeruli, metanephroi from E12 laminin α5 null mice were grafted into kidney cortices of 1- to 2-d-old ROSA26 hosts using procedures that were previously developed.14 In most cases, kidneys bearing grafts were harvested 6 to 13 d after implantation and fixed overnight in 0.2% paraformaldehyde in PBS that contained 20 mM magnesium chloride (pH 7.3). After equilibration in 30% sucrose, tissues were embedded in OCT and rapidly frozen in isopentane chilled in a dry ice/acetone bath. Kidneys were then serially sectioned in a cryostat, and alternate serial sections, 8 μm thick, were developed for β-galactosidase histochemistry as described previously.14,30 The nondeveloped sections were refixed with 4% paraformaldehyde for 10 min, incubated with 0.1 M glycine in PBS for 10 min, treated with 0.1% SDS in PBS for 1 h at 50°C, and stored at −80°C for possible immunolabeling later. For double immunolabeling, slides were brought to room temperature and incubated with rat anti-laminin α1 IgG (50 μg/ml) or with anti-VEGFR2 (50 μg/ml) and rabbit anti-laminin α5 antisera (1:100). After washing in PBS and labeling with anti–rat fluorescein and anti–rabbit rhodamine, sections were coverslipped with ProLong Gold antifade reagent (Molecular Probes, Eugene, OR). Sections were viewed by standard epifluorescence and differential interference contrast with a Leica DM5000B microscope (Bannockburn, IL). Slides were also examined with a Zeiss LSM 510 scanning laser confocal microscope (Thornwood, NY), and images were captured at an optical section thickness of 0.2 μm. GBM fluorescence intensities were measured on slides that were processed on the same day and viewed under identical conditions using the quantitative co-localization tool in the LSM 510 software package (Zeiss). For investigation of the ultrastructure of glomeruli developing within grafts, kidney tissues were fixed for 2 h on ice using 2% paraformaldehyde and 0.4% glutaraldehyde in PBS plus 2 mM magnesium chloride. Fixed tissues were then washed with buffer and sectioned to a thickness of 200 μm using a Vibratome (St. Louis, MO). Sections were then developed with Bluo-gal, which, in the presence of the LacZ gene product, β-galactosidase, yields an insoluble, electron-dense precipitate.31 Specifically, sections were developed in 20 mM potassium ferrocyanide, 20 mM potassium ferricyanide, 2 mM magnesium chloride, and 2 mM Bluo-gal (Invitrogen, Carlsbad, CA) in 20 mM Tris (pH 7.3) overnight at 37°C with gentle mixing in a rotator. After washing with buffer, samples were refixed with Karnovsky's fixative for 30 min, washed three times with 0.1 M sodium cacodylate plus 3.5% sucrose (pH 7.3), and then postfixed for 1.5 h with Palade's osmium tetroxide on ice. Samples were routinely dehydrated through ethanol and propylene oxide and embedded in Poly/Bed 812 (Polysciences, Warrington, PA). Funding for this study came from National Institutes of Health grants DK052483 and DK065123. Confocal images were acquired at the KUMC Confocal Imaging Facility, supported in part by the Kansas IDeA Network of Biomedical Research Excellence (RR016475). Portions of this work were presented previously in abstract form (J Am Soc Nephrol 13: 101A, 2002, and J Am Soc Nephrol 16: 427A–428A, 2005). We thank Dr. Elizabeth Petroske and Eileen Roach for technical assistance. See the related editorial, “Chimerism of the Renal Glomerulus Revisited,” on pages 2215–2217.